Spring is Here and It’s Time to Clean the Outside of Your Home. Once the weather breaks and we experience warm weather and sunshine, you can see what the cold winds and long winter season did to your home’s exterior. If your home and curb appeal is looking lackluster after months of cold, snow, and ice, consider these tips for your exterior spring cleaning guide. Depending on the material type of your exterior, you may or may not have some work to do with your siding. This is especially true for wood siding that is prone to paint peeling, cracking, or even rotting from moisture damage. If you discover these issues with wood exterior, it’s recommended to upgrade with vinyl siding replacement. The good news is that cleaning vinyl siding is easy---if it’s necessary at all. Simply mix a bucket of 70/30 water and vinegar. With a long-handled bristle brush, wipe away the dirt and grime that accumulated over the winter. Voila! Beautiful and vibrant vinyl siding will once again amplify your curb appeal. Clogged gutters spell big trouble for your roof and foundation. When you clean your gutters, you’ll need to climb on a sturdy ladder with shoes that have traction to avoid slips. Wearing a thick pair of gloves, scoop out the debris out of the gutter system. You can also clean it by flushing it out with a hose. There are devices available to help you clean your gutters from the ground. Over 500,000 people a year are injured from falling from ladders. Of course, if you want to avoid climbing those ladders several times a year, you can ask about our Bolt Gutter Protection which stops debris from entering your gutters in the first place. Call us if you would like a price or to learn more. If your windows are relatively new and in good condition, give them a scrub down. You can use a squeegee with water and a gentle homemade cleaning solution. If you prefer, you can use glass cleaning for a streak-free shine. If you discover that your windows are drafty, have condensation between the panes, or they are difficult to open and close, window replacement might be in order. Now is the time to start clearing out flowerbeds to prepare for new plants. Clear flower beds and areas of your yard from dead leaves, sticks, and other debris that can blow into your yard from the wind. 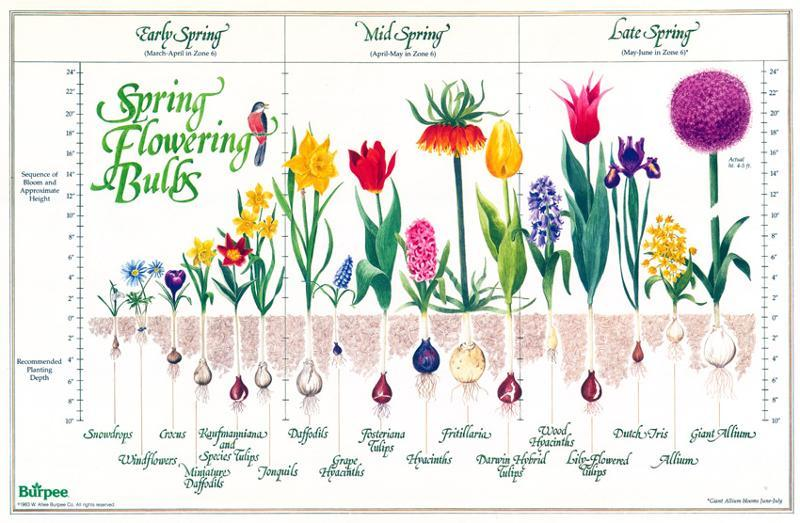 The following chart gives an idea of when you should begin planting specific types of bulbs. Envision your ideal exterior with a fresh spring breeze and the beauty of spring all around. Universal Windows Direct is dedicated to making your home more beautiful and energy efficient, enhancing every aspect of your exterior from windows to siding and everything in between. Which Window Style is Right For Your Home?